Well, you know, you'd see some fights. we saw a few fights, but we didn't play in places that were too dangerous (laughing). I think most of those places are gone now. But there were occasions were people would fall on the stage and knock mike stands over and stuff like that. Now, most of those places have enough bouncers to where a fight doesn't last very long if it starts in a bar. They got em broke up and outside. George still found time to attend class at Southwest Texas State and supplement his honky tonk earnings by working on the family cattle ranch. Still, in the 70's the Ace in the Hole gang was building a solid regional reputation, roping in opportunities to open local concerts for such national acts as the Texas Playboys (perhaps Strait's main idols). Moe Bandy, Johnny Rodriguez and John Anderson. After six years the boys were getting pretty tight. "You do get tight playing for that many years," Strait agrees matter-of-factly. "And whenever you play with a big act or somebody you know is going to draw a big crowd, it's always good because it get you a new audience." Enter Erv Woolsey, currently an MCA Record executive, who had been operating a club in San Marcos. Woolsey booked Strait and the Ace in the Hole Band in his club before assuming a larger booking role. When Woolsey returned to the music business in Nashville, he and Strait remained in touch. 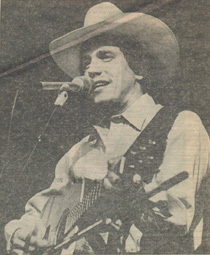 In 1981 Woolsey brought Strait to Music City, where he teamed him with MCA and producer Blake Mevis. Their first studio session yielded Unwound, Strait's first national hit, and Strait Country, his debut album. How did the Texan and Nashville take to one another? Well, I like Nashville a whole lot, "Strait says, smart enough not to kick the establishment where it hurts. "It's a great place, everything is right there, all the country music is in a little concentrated area. I have a good time every time I go there. I wouldn't want to live there because I've got too many roots in San Marcos. I doubt if I'll ever move from here. "But I love to work there, in the studios. People are real friendly. It wasn't Straits first Nashville effort. Years earlier he had cut some sides with Darryl Sadler (who wrote Straits single, A fire I can't put out)." The sides did not set the country world aflame, but one, ironically, was recently recut and will appear on Strait's forthcoming album (tentatively titled Right or Wrong, due this fall. Producer Mevis also worked on Straits second album, but the man from Texas, the one whose brand of country is closer to old fashioned swing than to crossover "contemporary", said Nashville did not try to cramp his style. "Really it's up to you and your producer", Strait says. "The record company didn't really come in there and get involved. Normally they don't. The producer is the boss when your in the studio, and Blake and I were working pretty good together We chose the songs together and made the album together." But it's not the usual Nashville country, is it George? "Yeah, I would say so. But I think there may be a trend in country music right now in going back to more traditional type songs. Well, that's about all he's got to say on the subject. If George isn't unassuming, then Texas isn't big. It's a matter of fact with one of country's bright young hopes. Heck it's just Ol country and western anyway. Nothing to take too seriously, not the fame , not the fortune, not even the realization of a dream. Or was it a dream? Naw, it was just in the cards. An Ace in the hole, and comes a time to play your hand. Ol' George plays it straight, that good, hard, swingin country and western that was country before country was cool, before it lost its grit and twang and spilled its banks into the pop mainstream. Of course George Strait is Texan. "Growing up I pretty much listened to all kinds of music, even rock n' roll," says the man who appears at the Frontier Days Park in Huffman next Sunday. "Growing up in Pearsall (where he worked on the family's cattle ranch outside of Big Wells), my dad was more interested in listening to the farm and market reports, news and stuff like that. But my main influences, I would say would be Merle Haggard and George Jones, Bob wills and Hank Williams. And when I first started singing, those are the kind of songs I would learn. I would listen to those records and learn those songs on the guitar and I'd buy all the sheet music I could find. I just taught myself how to play the guitar and sing. Just that simple. George Strait figured he'd be a singer someday, growing up in south Texas where that good C&W took root in the dance halls and bars in every town on or off the map, where basically it's just a way of life. But the metamorphosis from dream to reality was to take place far from home. After high school, Strait enlisted in the Army, where he spent three years and wound up stationed in Hawaii. His gig then was working in the payroll and dispersement division hardly a place of discovery. But one of the Generals on the base was forming a country band and George went for it. He passed an audition and ended up fronting the band. "I don't know what got into me, just to tell you the truth" he tries to explain. "I just felt like I could sing good enough to make a career out of it. So one day I just felt like I needed to get serious about it, and that's what I did". Just that simple. Returning from the service, George enrolled in Southwest Texas State University in San Marcos where he put his name up on the bulletin board as a singer in search of a band. Among the first responses were from those who were to become Strait's Ace in the Hole Band (there have been subsequent personnel changes, with a new guitarist Rick McCray and Eddie McArthur and drummer Roger Montgomery). In a run down house in San Marcos the boys honed their chops, putting together a rolicking country and western sound that would take them, well, anywhere they could find work. "We played everything back then," Strait laughs. We played wedding or any kind of function they would pay us money to do. We played all over south and central Texas-all the little honkytonks and bars everywhere. we played around San Marcos a whole lot, Austin, Houston and Huntsville. Every little town in Texas, you know has their little honky-tonk. We tried to work as many as we could. We played VFW's, anything. "We were booking ourselves then. Our drummer Tommy Foote, who is now our road manager, was doing the booking, keeping us pretty busy. W were working four an five nights a week then". How about those honky-tonks? Did Strait and Ace platy some pretty rough joints?